Your baby's crown-to-rump length at this time is approximately 14.4 inches and the total length is approximately 21.5 inches. The average baby weighs a little more than 7 pounds now and is preparing for birth. You are probably as big as you are going to get and may be uncomfortable now. Most women gain between 25 and 35 pounds during their pregnancy. Your uterus is about 7-8 inches above your bellybutton now. Although your baby continues to grow and develop inside of your uterus, there is not much room for her to move about. All of your baby's organ systems are now complete and the lungs were the last to fully mature. Most of the lanugo on your baby should be gone by now. Your baby still may have some on her shoulders and in the creases of her body. Your baby's toenails have reached the end of her toes. The umbilical cord is about a half inch thick and may be wrapped around her. The umbilical cord still supplies the baby with nutrients that she needs. After delivery, your baby's umbilical cord will be clamped and cut. After it is cut, she will be an independent human being and must perform all of his body functions on his own. Your baby will get antibodies from your body that give his immune system a boost. 39 weeks and I am more uncomfortable as ever. I am trying not to let the uncomfortableness out weight my excitedness to welcome her. I just want her out. I am so ready and Joey is too. And yes people, I am still at work. I have had about 10 "still here?" & "hanging in there?" comments by noon today. I plan on going the distance and will not leave work until my doc will confirm I can't go. That will probably be when Audrey arrives. I have a schedule on how I want to use my Maternity leave and I want to save it ALL for after she comes. "When are you due? ", "do you know if it is a boy or a girl", "do you have a name picked out," "are you taking time off work before? ", "are you ready," "is this your 1st? "....and the list goes on and on. I just want to be able to pull out the card with the answers to all of their questions, hand it to them, then go about my day. OK, so that may be rude so I won't do it. But latley, I have made sure I have my headphones on (even if I am not listening to any music, seriously) and that has done the trick so far. People don't try to talk to you when they think you are listening to music. Anyway, I had a doc appt on friday. I am 1.5cm dialated and 70% effaced. The doc said at least its something since last week there was nothing what so ever. BUT, she didn't give me an estimate as to when I could go into labor. She said it still could be a week or two (they will let me go to 41 weeks before getting induced). Lets hope its within the next week. But Audrey is doing good and we are both still healthy. Food cravings? : root beer - wierd? yea I thought the same thing too. Milestone: 39 weeks and the fact that we are VERY prepared for her arrival. 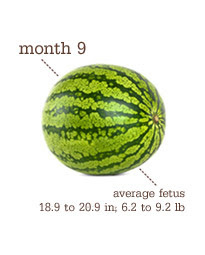 Your baby continues to grow this week and weighs about 6 to 6.8 pounds. Her crown-to-rump length is still about 14 inches and total length is around 20-21 inches. Most women do not grow any larger during the last few weeks of their pregnancy. From the top of your uterus to your bellybutton is about 6.5 to 7 inches. You may be very uncomfortable now-you are almost there! Over the last few weeks of pregnancy, your baby has been building up waste materials in the intestines. This waste material is known as meconium and is greenish-black in color. Meconium is made up of cells that your baby has shed, lanugo and other substances. Meconium is the first waste that your baby will pass after birth. However, sometimes babies pass meconium before delivery and are delivered with greenish-black waste covering their body. Special care must be taken when a baby passes meconium in the womb. The baby's skull is not fully solid as the five bony plates, known as fontanels (little fountains), are still separate and can be pushed together. Birth may mold and elongate the fetal head, a safety precaution to reduce the skull's diameter for an easier birth, without damaging the fetal brain. After delivery, the baby's head returns to a rounded shape. Eyes have no tear ducts yet, they appear a few weeks after birth. 38 Weeks and we are totally ready. Car seat is installed, hospital bags are packed and Friday Joey and I went on a shopping spree and got everything we still needed for when Audrey comes. We even bought a video camera. Now its just a waiting game. I have had no labor signs and the doc didn't check for progress on friday because of the fact that I haven't had any contractions. Audrey is content in there so we are patiently waiting for some sort of action. I am really hoping that she decides to come before I hit the 41 week mark. But her parents are two stubborn people so she just might have that characterisitc already and make us wait longer than we want to. We will see. 37 Weeks = FULL TERM!!! You are considered full-term now and your baby's final touches are being made. The crown-to-rump length of your baby is now 14 inches and the total length is around 21 inches. Your baby weighs approximately 6.5 pounds. Your uterus may be measuring about the same as it has been and is probably about 6.5 inches from the top of your bellybutton. This week your baby should engage into your pelvis. If this is not your first pregnancy, it may happen later. When your baby engages, his head drops down into your pelvis and you might feel a slight sensation called `lightening` as the pressure on your ribs eases. As your baby drops into the final position for delivery, you may experience a buzzing feeling and shooting pains in your groin and leg. Normally, you will be able to breathe and eat easier. However, your uterus pushes down harder on your bladder and you will have an increased urge to urinate more frequently. Even if your baby engages now, you still possibly feel his feet in your breastbone around week 40. Your baby is now fully mature and ready to be born. However, your baby is still growing and developing every day. Fat is still being laid down at a rate of a half ounce a day. If this is your first pregnancy, you can expect to deliver closer to 40 weeks or shortly thereafter. If this is not your first baby, you might go earlier than 40 weeks! Your doctor may begin doing weekly pelvic exams to evaluate your cervical changes and progression. Your healthcare provider will make sure that you are not leaking amniotic fluid and will also examine your cervix to check for effacement and dilation. Before labor, your cervix is thick and 0% effaced. During labor your cervix thins out and right before delivery it will become very soft and 100% effaced. Research shows your baby can be affected by stress hormones. Make time to relax, to have fun, and to rest. Your baby has learned to coordinate sucking, swallowing and breathing so it can do all three after birth. Babies practice shallow breathing before birth, using amniotic fluid. At my last two appts the doc said that she is definatly head down which is a plus. On friday I was checked for progress and so far there is none. I am a bit thinned out but that is about it. She is still a mover and a shaker and her heart rate continues to be around 140bmp. I haven't had any real contractions but I can now notice the braxton hicks contractions. Soooo I guess thats a start. I have a feeling she will be in there for a while longer but she will be evicted at 41 weeks and no later. I really hope she decides to come before that. Joey and I are very anxious and we just want her here already. I have told her every day for the last week that she can make her arrival at any time. We will see. I think we pretty much have everything we need. Joey and I will go make a babies r us run on Friday to get some odds and ends. She will be here sooooo soon. WOW!! Best moment this week? : making it to full term- Joey and I are both premies (7 weeks early) so making it to full term and ensuring that she is a good size and has a reduced chance of spending time in the NICU. What I'm looking forward to: For her to be here already!!! By this week of pregnancy your baby's crown-to-rump length reaches about 13.5 inches and the total length is approximately 20.7 inches. Your baby weighs about 6 pounds now. The top of your uterus has moved further up under your ribs and is about 5.5 inches above your bellybutton. Your uterus has grown a lot in the past few weeks as your baby has gained weight. You may have gained about 30 pounds by now and it is common for your weight to stay about the same from this point onwards. Because the top of the uterus is high as it will be, breathing may be getting very uncomfortable at times. You might notice jabbing pains from your baby's kicks. However, within the next few weeks, your baby will drop into the birth canal and this will make breathing easier again. Most doctors like to see their patients weekly from now on to check for labor progression. Your baby's face has filled out significantly and looks smooth and plump. Because your baby has powerful sucking muscles and has had layers of fat forming for quite some time now, the cheeks have filled out like a newborn's. Your baby's skull is firm, but not hard. Every baby's head has the ability to give slightly so that there is room for her to fit down the birth canal during delivery. Some babies are born with cone shaped heads from the pressure of delivery, but this will go away after delivery. The amount of amniotic fluid is at its maximum amount now and your baby may not be moving as much as she had been. As long as you still feel her movements every day, there should be no cause for concern. Stretch marks? : I have discovered a few small faint ones on the under belly. and suprisingly I am ok with it. Milestone: making it to 36 weeks without any major complications - knock on wood. Your baby now weighs over 5.5 pounds and its crown-to-rump length is approximately 13.2 inches. Your baby's total length is around 20.25 inches at this point. This week of your pregnancy your baby's fingernails will have definitely reached the tips of his fingers. When your baby is born, his nails may look long and pointy. Your baby is less likely to scratch himself at this point because of the lack of room in the uterus. Fat deposition will still continue and your baby is getting chubbier and rounder. Your baby's shoulders are plump at this point. The baby begins to develop its own immune system. Joey and I had a great weekend. We took maternity phones on Friday and they turned out really well. We get them back on Saturday. It will be hard to decide which ones will get framed. They are all really good. We had our first childbirth prep class on Saturday. It was just ok. I have pretty much read about everything that they covered so I was not surprised by any of it. This Saturday they will go over complications and misc stuff so that might be a little more informational.We'll see. And Sunday was my baby shower! I had such a great time and it was great to see everyone. We played fun games and Audrey got TONS of stuff. Lots of necessities and lots of clothes. She is going to be one well dressed child. Everyone definatly spoiled her with all of their generous gifts. Joey and I are very greatful. Since I was the one who opened the gifts, Joey went through everything at home and put things away. He was like a little child on christmas with everything he saw. He was very excited. We kinda put things away and started to get the room in order. BUT we still need to find a place for a few things and organize a bit. We also need to get a couple more essentials but all in all we are pretty much ready for Audrey to arrive. Yea!! Next up is my work baby shower this Wednesday, prenatal appt on friday and childbirth prep class on Saturday and hosptal tour next saturday. And a little more shopping in between. And maybe I'll try to rest...but we will see about that. Your baby's crown-to-rump length this week is approximately 12.8 inches and the total length is around 19.8 inches at this time. Your baby now weighs almost 5 pounds. Braxton-Hicks contractions are going to get stronger and more frequent within the next few weeks. Braxton-Hicks contractions feel like a tightening at the top of your uterus that spreads down and then relaxes. Many women mistake Braxton-Hicks contractions for true labor contractions, but this is rarely the case. Braxton-Hicks contractions will diminish if you get up and walk around and they should not be painful. Your baby's hair continues to get longer and thicker. Your baby's hair color probably is not going to be the same color from birth onwards, so you should expect it to change in color. Your baby is shedding most of lanugo, but the amount of vernix caseosa is increasing. Your baby is taking calcium from you to lay down lots of bone. Continue to take your prenatal vitamins and drink milk to ensure that you receive enough calcium. If you were to deliver your baby now, it would probably be called a pre-term infant instead of premature. The only difference is in the maturity, particularly lung maturity. A pre-term baby is less likely to need intensive care because its lungs have developed. The baby now rests on your uterus and is no longer floating. Fingernails now reach over the finger tips and the baby can scratch itself. Next Friday- meet with possible peditrition & a prenatal check up-the start of weekly check ups!! In between all that we will be doing some MAJOR shopping to get all the odds and ends that we will need. Almost ready! Food cravings? : sweets....sweets....and more sweets. Its the only thing that sounds good. What I'm looking forward to: Maternity photos & my baby showers!!! Milestone: 34 weeks is a pretty good one considering that both Joey and I were born 6.5/7 weeks early.